Last year, I joined Harold Jarche’s Coffee Club, a professional community of practice that meets via Zoom once a month – and like Vegas, what happens in the conversation stays in the conversation. So other than to say this morning’s conversation was delightful – with individuals from Canada, USA, UK and Brazil – I will not go into the specifics. 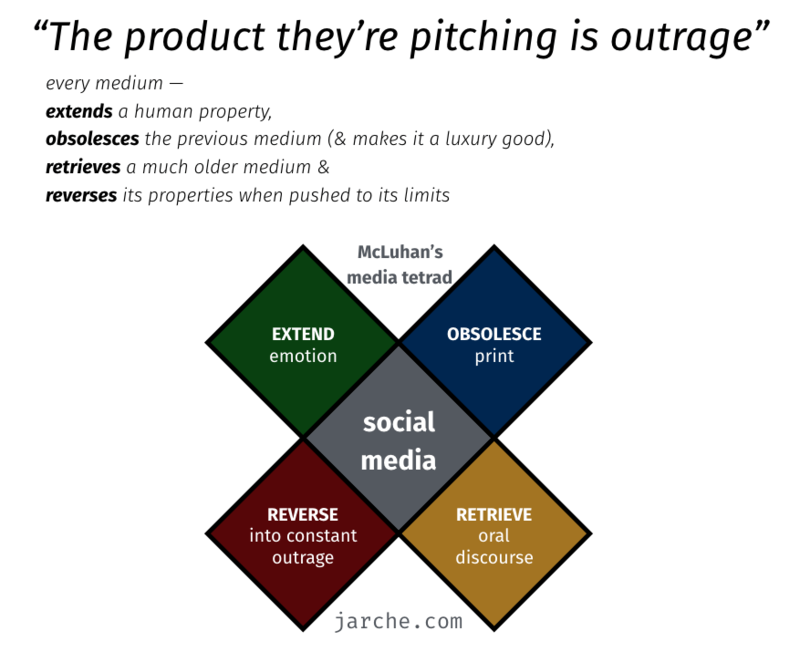 But Harold did bring up his recent blog post “Constant Outrage“, and I find his use of McLuhan’s tetrad intriguing. 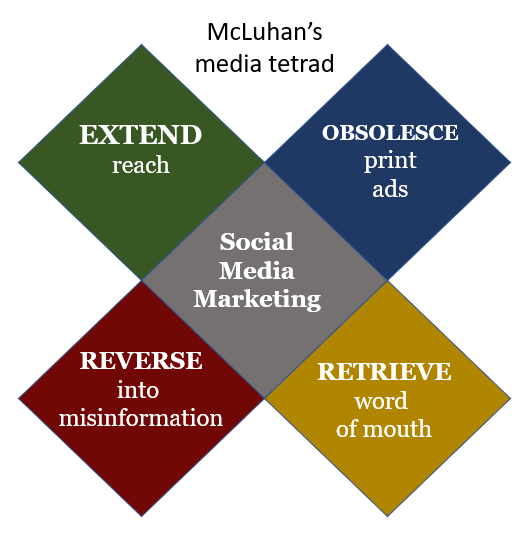 Harold has been using Marshall and Eric McLuhan’s tetrad for the past decade to examine impacts of medium on those who use it. In the image above, he focuses on social media, and how it on the one hand extends emotion, makes print media somewhat obsolete, revives the old traditions of oral discourse, and when pushed to the limits, fuels constant outrage. This spring, I plan to add aspects of Siva Vaidhyanathan’s Antisocial Media and Springer and Brooking’s LikeWar to the content to balance out the affordances of social media, hoping to spark some critical thinking about the unintended consequences of the use of social media. I still think that a course on social media and education is important…as we in education have an obligation to improve the digital literacy of our students – and they are likely using social media now. Balancing the aspects of the tetrad will give a better overview of the use of social media now. The certificate students are interested in the nuts and bolts of developing a social media marketing plan for their school – which is important. But I want them to also consider the other aspects that social media brings with it. 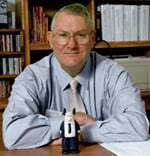 Harold has noted in the past that one of his more difficult tasks is getting people he works with to recognize the difference between complicated and complex environments. 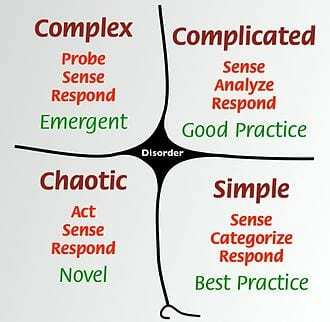 Harold has used the Cynefin framework as an aid to decision-making. I suspect that my certificate students are approaching social media as a complicated situation…where one can rely on preplanning…but my worry with how social media has evolved is that it is really a complex situation. As Harold noted, complexity and chaos are the new normal! So for both of these courses, I hope to push past the hype of social media and surface critical issues that school leaders need to consider. Thank you Brit for a thoughtful piece. There is much that can still be learned through an understanding of complexity and emergence and the contributions that Harold makes are very useful. I have also found the work of Mary Uhl-Bien, who was at Lincoln (not sure if she is still there) useful in making sense of emergence. One aspect I find interesting at present is the move away print media. Many see this as merely a change in media, as a physical phenomenon. It is really deeper. Most of us who write have been taught to think before we write, and the process rarely occurs without at least one phase of revision, and often with a complete overhaul. There is a purposive moment. I’m not sure that we have yet learned how to use social media in conjunction with older and enduring tools like writing. 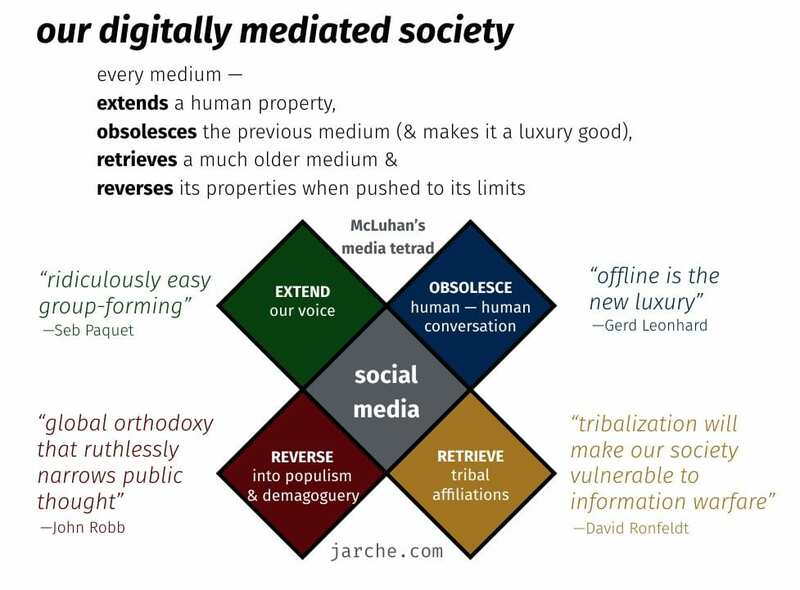 Social media is useful as an alert to what is happening, and as a path to finding out, but on its own is only a means of exchange, not of engagement and dialogue (I note also a growing confusion of equating social media to digital communication). Print – analgue or digital – must re-emerge as a key way to make sense in the complex world. That, in turn, requires us to take a little more time to reflect and think about our experience. Perhaps it is not the emergence of social media that is the problem. Learning how to learn might be. Thanks again for giving us a moment to stop and think.